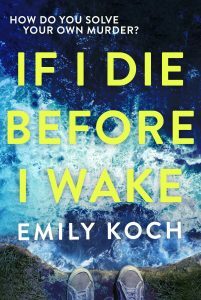 Emily Koch’s If I Die Before I Wake is an audacious concept for any writer. Alex is in hospital after a climbing accident, kept alive via life-support machine. Who is trying to murder him and why? He has to work out who, without being able to communicate. The sense of jeopardy in the novel is intense, especially when Alex’s girlfriend, Bea, is threatened. As readers we are also hooked on the plot – how will Koch deliver the answers to the conundrum? How can it all play out? Once Koch decided on the unique concept for her novel, just ponder for a moment the writing challenges. Your main character has ‘Locked-In’ syndrome. He cannot see or talk, is immobile in a hospital bed. He cannot interact and can only observe. Scenes are set in one hospital room. Action outside the room – police activity, stalking, romance must be delivered by conversation from visitors to that room without any of it seeming forced or strained. The protagonist cannot see what is happening or describe characters, he has to infer everything from speech and action or inaction. And everything is filtered through one consciousness without leaving the reader bored. Koch uses the limitations of the scenario to good effect. Smell, sound and touch are heightened. Alex differentiates people he doesn’t know by their smell – Nurse Pauline is marzipan and Quiet Doc smells of white spirit. Alex only has his memory of past events and his consciousness and intelligence to guide him through. His thoughts then become the novel, so as readers we are pulled incredibly close into a dramatic world. When Alex has opinions or talks to himself, Leave me. Go. Koch uses italics, elsewhere when Alex describes what he thinks is happening in the room, she doesn’t. The book is an immersive, convincing read and then of course there’s a love story, the beating heart of the novel that creates such heart-stopping, poignant scenes. I’m full of admiration for Koch who presents a fight scene in the hospital room only through the prism of what the character can hear but replays it in Alex’s imagination as if he is able to get up off his bed. It makes for a glorious literary read. Although it’s told in first person the novel is told in past tense, a wise choice I think as first person would have been too claustrophobic. The exception is the last chapter, a wonderful elegiac end to a fabulous read. This novel made me cry, not once but again on the re-read. When a narrative and characterisation is so vivid and compelling that it becomes part of your story-world of literature, you know the author has hit gold. The research that went into the book was clearly extensive – Koch learned to climb, researched locked-in syndrome, police procedurals and medical procedures in order to write the book. Her journalistic background is clearly in evidence. As we all know books need the stamp of authority behind them. To write well, apart from passion, technical craft and determination is the ability to create believable story-worlds for readers. Emily is guest speaker at Novel Nights on July 25th discussing How To Research. Join us to hear Emily talk on the subject. Copies of the book will be on sale with Foyles. Emily is a graduate of the Bath Spa Creative Writing Programme and award-winning journalist. The book was drafted eighteen times over four years before being printed. If I Die Before I Wake has been up to Number 4 in the Amazon Fiction chart and number 18 in the Sunday Times hardback fiction bestseller list. Write what you don't know. Review of Emily Koch's talk.